I’m setting here at 1 AM listening to Bust A Move, by Young MC. It’s not my fault though, I accidentally took like a 3 hour nap this afternoon, and then I saw this post on Noel’s blog about Pac-Man. That was hilarious. 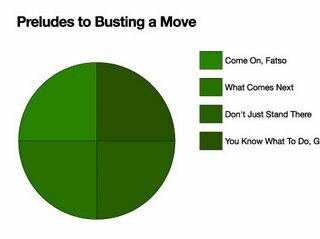 I started clicking around and within a few minutes I found this pie chart, which is also pretty funny. This entry was posted on November 5, 2006 at 7:20 am and is filed under Blog. You can follow any responses to this entry through the RSS 2.0 feed. You can leave a response, or trackback from your own site. Great song! I get that bass line in my head pretty often even though we don’t even have the song. I’m pretty sure none of these have been used on me. Well, I think I’ve heard the third one. Great pie chart!